Usage Apply a few drops on wet skin. Gently massage & wash it out. We have been counted amongst the most trusted names in this domain, engaged in providing Vedic Line Sandalwood & Turmeric Face Wash. This Ayurvedic Face wash is enriched with turmeric and sandalwood. It has healing and soothing properties. Perfect to attain that golden glowing skin. • Deep cleans the skin. • Heals the damaged skin. • Provides brightening glow to the skin. • Reduces scars and breakouts. 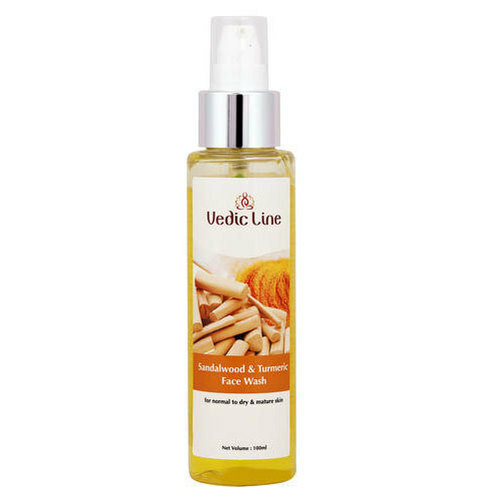 • Ayurvedic Face Wash For Normal to Dry & Mature Skin.